In a fluid-structure interaction (FSI) scenario, the fluid can affect the structure, the structure can affect the fluid flow, or both. When modeling a device that relies on FSI, you may want to simulate one of these options, a combination, or all three. The Fluid-Structure Interaction multiphysics coupling in the COMSOL® software makes it easy to implement FSI in your analyses. In this blog post, we study the flow through a ball check valve for different flow directions and pressures. Check valves are simple, two-port valves in which fluid flows in one direction and out the other with no backflow. A ball check valve is a type of check valve in which a ball is used within the valve to stop the backflow. You’ve probably used a ball check valve if you’ve ever used a manual air pump for a bike wheel or basketball. The tiny spigots for liquid and gel dispensers, such as for hand sanitizer, also operate as ball check valves. Ball check valves vary in design and use. For some variations, the ball is unattached in the valve, while for others the ball is aided by a spring mechanism. What these devices have in common for the most part is their inexpensive cost, small size, and simple manufacture and construction. A ball check valve also happens to be an illustrative example of fluid-structure interaction. 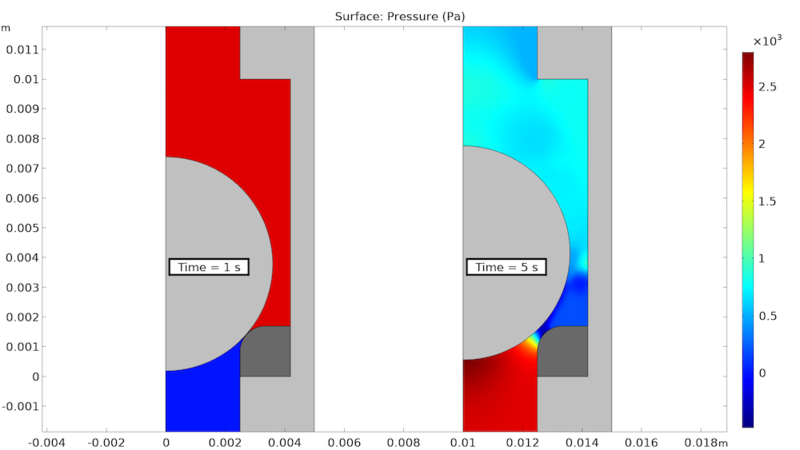 Let’s take a look at the Ball Check Valve tutorial model to demonstrate the benefits of the Fluid-Structure Interaction multiphysics coupling in the COMSOL Multiphysics® software. In this model, FSI is combined with a mechanical contact to simulate the closure of a spring-loaded ball check valve. The ball check valve model is a structural contact problem in which a fluid is surrounding and acting on solid parts (the valve housing and the ball). Modeling a situation like this, where two objects that come into contact will completely shut off the path of the flow, is particularly challenging. When the valve is closed, the topology will change so that one fluid domain is split into two disjoint domains. The way it is handled in this model is by adding a small offset to the contacting surfaces, so that there is always a remaining small flow channel, even when contact has been established. In this way, the topology change is avoided. The resulting flux, however, is negligible, and the pressure drop occurs over a very short distance. The Structural Mechanics Module and MEMS Module, add-ons to COMSOL Multiphysics®, include a predefined coupling for simulating fluid-structure interaction. The Fluid-Structure Interaction multiphysics coupling sets up all the extra equations that need to be taken into account for FSI problems. Since the shape of the slit between the ball and the O-ring changes a lot during the simulation, as shown in the animation above, remeshing is necessary in order to maintain a good quality of the mesh elements. The tutorial model demonstrates a remeshing technique that can be used to accurately resolve the fluid domain between the ball and the ring. After running the coupled analysis, you can inspect the behavior of the ball check valve. First, there is the function of the valve, preventing backflow in the reverse flow case and allowing flow in the functional case. In the results below, you can see the fluid pressure in the valve under both functional and reverse flow conditions. You can also evaluate stress in the solids. Fluid pressure in the ball check valve under reverse (left) and functional (right) flows. After confirming that the check ball valve functions as expected, you can inspect the performance of the valve and use the results to make design considerations. The velocity of the fluid is an important characteristic of the ball check valve. You can see how the flow moves through the valve, calculate the maximum velocity, and use the average velocity at the outlet to determine the maximum flow rate through the valve. 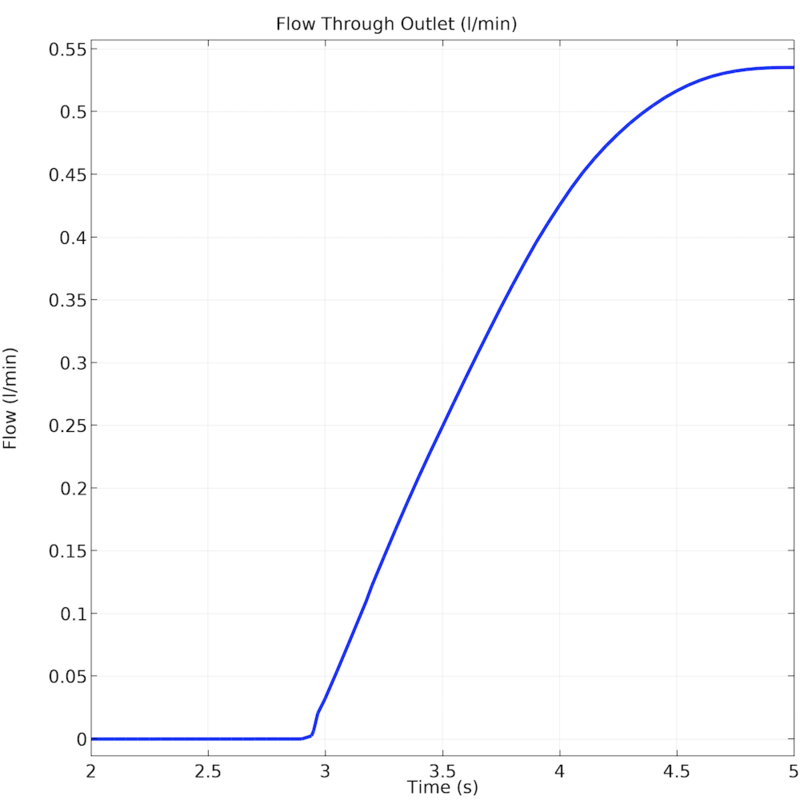 Additionally, you can view the operating curve of the valve by plotting the pressure as a function of the flow rate. 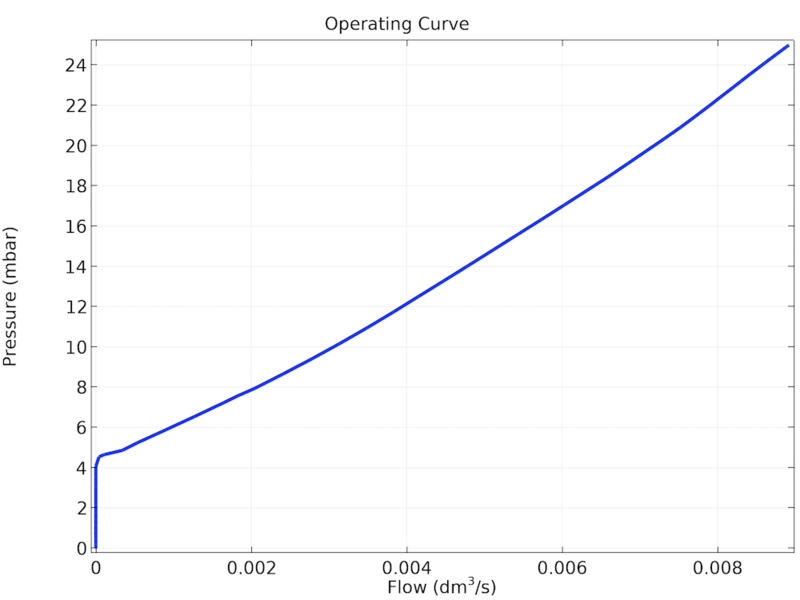 Fluid velocity at the fully open functional stage (left) and the flow rate through the valve outlet (left). The opening pressure for this check ball valve is about 4.5 mbar, when the flow raises to a nonzero number. Of course, there are many additional examples of how you can use the COMSOL Multiphysics functionality for modeling fluid-structure interaction. 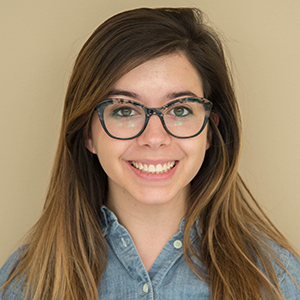 Are you working on an FSI analysis? Tell us more in the comments below! 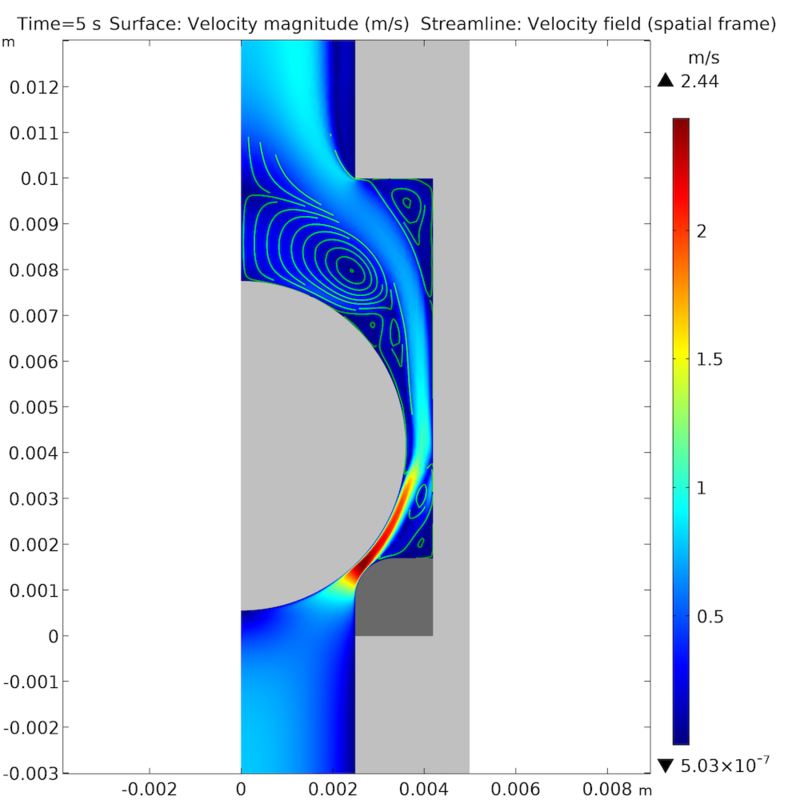 Try using the Fluid-Structure Interaction multiphysics coupling to model a ball check valve. Clicking the button below will take you to the Application Gallery, where you can download PDF documentation and, with a valid software license, the accompanying MPH-file. What Kinds of FSI Problems Can COMSOL Multiphysics Solve?